CLASSIFICATION: Regular Non-Merit - Serves at the discretion of the Department Director. The purpose of this job is to manage and evaluate staff, programs, finances, services and operations as assigned within the Leisure Services Department. Under limited direction, guides self and/or leads staff in the development, implementation, management and evaluation of programs, operations and functions. Contributes to the Leisure Services Department management team through leadership, management, administration, planning and project delivery. Performs additional tasks as assigned. May be required to work on religious holidays. When requirements include vehicle operation, responsible for the safety, readiness and operation of the vehicle and must abide by ACC's safe driving policy. Bachelor's degree in a related field with five years of related experience required; or any equivalent combination of education, training, and experience which provides the requisite knowledge, skills, and abilities for this job. Must possess three years supervisory experience in a related field. 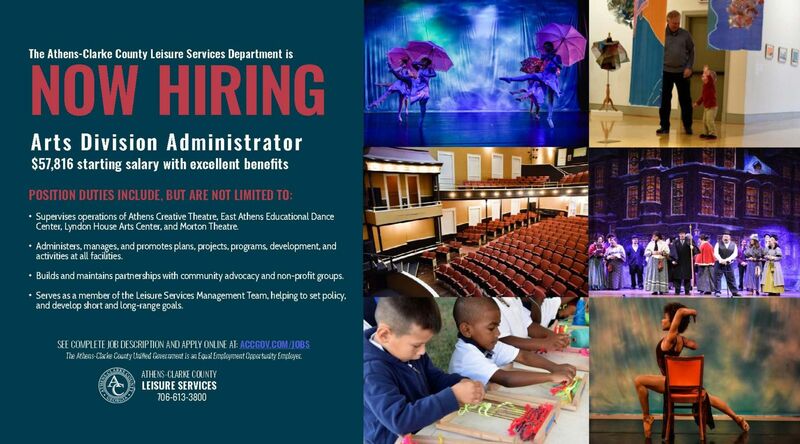 When assigned to Arts, Nature or Recreation Divisions, must have a minimum of three years full-time programming experience in the respective area of program delivery. The following duties are normal for this job. These are not to be construed as exclusive or all-inclusive. Other duties may be required and assigned. Supervises and evaluates assigned staff, and provides operations management of assigned facilities. Recruits staff and recommends for hire; handles employee concerns, directs work assignments, counsels and disciplines employees when necessary, and completes employee performance appraisals. Assists with new employee orientation, ongoing training and professional development of assigned staff. Observes and reviews operations, staffing levels, programs, etc. for optimum efficiency and effectiveness, and reports recommended changes when needed. Attends various work unit programs to evaluate and support programs. Assists with department-wide special event planning and execution. Attends special events as assigned. Coordinates the collection of data and analyzes it to assess programs, services and operations. Develops performance goals and measures with and for work units. Provides necessary reports to the Director or designee. Prepares and implements short and long term goals and objectives. Develops operating and capital improvement budgets including a five-year plan; manages expenditures and revenues of assigned cost center budgets. Trains staff on budget operations and supervises all expenditures and revenues within assigned cost centers. Administers and manages the planning, implementing, monitoring, and evaluating of projects, programs and activities. Negotiates, drafts, reviews, and recommends contracts and agreements. Serves as liaison to other government, non-profit, private and/or special interest groups or members of the public as assigned; provides technical expertise, and professional assistance/participation. Researches, plans, evaluates, and analyzes appropriate technological development and its impact on operations. Enforces department/government policies, procedures, rules, regulations and ordinances; keeps staff informed of appropriate departmental/governmental changes in a timely fashion. Researches, writes, manages and administers donations and grants for program and facility enhancements in conjunction with the Development and Outreach Coordinator. Coordinates with other divisions and departments the planning, organizing, and implementation of shared programs and services. Prepares Department for agency accreditation and ensures its continued future accreditation. Shares after-hours emergency duty coverage with Division staff. Responds directly to emergency after-hours calls from supervisor. Writes, revises and/or reviews Department and/or Division policies as needed and directed. Writes agenda reports as assigned, prepares and presents materials to Mayor and Commission as required. Performs special projects and duties as assigned by Department Director. Works with assigned staff to develop and periodically update Department programming plan covering current year and 3-5 years, including programming philosophy, activity selection, type and scope of programs, and outreach initiatives. Works with staff to develop specific and measurable program objectives and performance measurements for programs and services of respective Division. Develops systematic processes for program and services evaluation; analyzes and uses data to consistently improve program and service quality for respective Division. Stays current with appropriate trends, and periodically assesses linkage to department's programming goals and objectives. Knowledge of the principles, practices, and procedures of the Athens-Clarke County Government and the operations and functions of the Leisure Services Department. Knowledge of sound management practices, human resource management/personnel, financial administration and management, long range planning, policy development, grant writing, non-profit organizations, and policies and procedures as necessary in the completion of daily responsibilities. Knowledge of program planning, to include development of plan, program and service determinants, participant involvement, fee determination, cooperative programming, establishment of program objectives, program evaluation, community outreach, program scope, selection of program content and program and service statistics. Knowledge of all applicable laws, ordinances, policies, standards, and regulations pertaining to the specific duties and responsibilities of the job. Knowledge of organizational, management, human relations, and technical skills. Knowledge of the principles and practices of arts, recreational and educational administration, departmental rules and regulations, funding and development resources, community resources, supervisory practices, accounting and bookkeeping practices. Knowledge and skill in the use of office equipment, various software programs, desktop publishing, and audiovisual equipment. Ability to develop and keep abreast of any changes in policy, methods, operations, budgetary, and equipment needs, etc. as they pertain to division/department, fund raising, marketing, grant writing and human resource/personnel operations and activities. Ability to effectively and professionally communicate and interact with subordinates, management, employees, members of the general public and all other groups involved in the activities of the Athens-Clarke County government as they relate to the Leisure Services Department. Ability to lead teams, and to professionally and effectively serve as a team member. Ability to develop and administer policies and procedures, train staff in the development of facility and division performance measures, plan activities to monitor performance of subordinates against measured established goals. Ability to develop and implement short-term and long-range goals for the Division and Department in order to promote effectiveness, efficiency, and appropriate development in accordance with changing community needs. Ability to use independent judgment and discretion in managing subordinates including the handling of emergency situations, determining and deciding upon procedures to be implemented, setting priorities, maintaining standards, and resolving problems. Ability to assemble information and make written reports, documents, policies, proposals, and procedures in a concise, clear, and effective manner. Ability to develop, comprehend, interpret, and apply regulations, procedures, and related information.